The Triple Threat Club has solved intense mysteries before . . . but this time it's personal. Cassidy, Allison, and Nicole fight for justice every day-Cassidy as a crime reporter, Nicole with the FBI, and Allison as a federal prosecutor. Together they're a Triple Threat to be reckoned with. But never have they faced a case so full of blind alleys-or so painfully close to home. When a devastating turn of events upsets the balance of the Triple Threat team, they discover an ally in a quirky Private Investigator named Olivia. The women vow not to stop until the case is solved and justice is served. Yet just when it appears the police have the killer in custody, he somehow strikes again. Not knowing who to trust, the Triple Threat women go undercover for an intricate and deadly cat-and-mouse game where nothing can be taken at face value . . . and nothing will ever be the same. 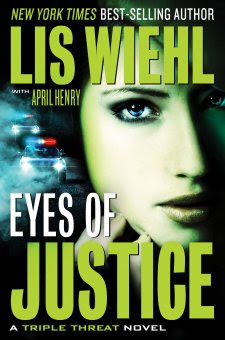 Eyes of Justice, is the fourth novel in the Triple Threat Club series by Lis Wiehl. 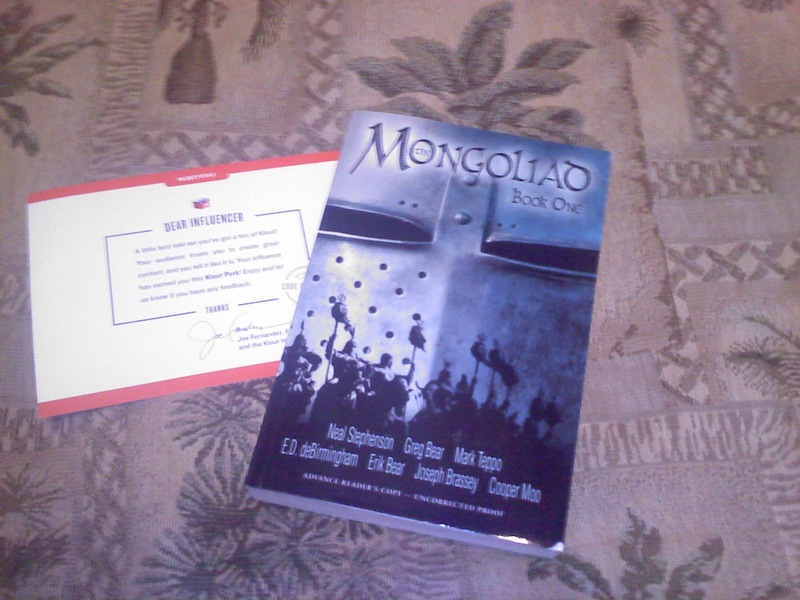 When I received this from Booksneeze I was excited, even though I hadn’t read the first three. Last year I reviewed Wiehl’s paranormal mystery called Waking Hours the first in her new East Salem trilogy. While this novel is part of a series, Wiehl has done an excellent job of allowing it to be read as a standalone. This was a suspenseful read, with lots of twists and characters I enjoyed. The main characters are three women who all went to high school together, but were never really friends. At a reunion, they discovered they all had a lot in common. The charming Cassidy Shaw is a crime reported at Channel Four. Allison Pierce is a federal prosecutor and Nicole Hedges is an FBI agent. One thing led to another and they all began working in Portland. They got together one evening for dinner and enjoyed themselves immensely. While each has a completely different personality, they bring out the best in each other. That night they shared a rich chocolate dessert. One slice, three forks and they jokingly called themselves the Triple Threat Club. That was six years ago and they have been friends ever since. When this novel begins, it’s Cassidy’s turn to choose the restaurant, and she picks loud and Mexican. However, she text the gals that she will be late, when a mysterious caller tells her he has proof that the cops planted a gun to cover up a shooting. Cassidy never makes it to dinner, and the tale that unfolds is suspenseful as Allison and clue driven Nicole search to understand what happened to Cassidy. When Portland PD decides they cannot be involved, they hire Ophelia, an independently wealthy private investigator to help. The tale was very suspenseful, and I didn’t figure out who was involved until almost the end. I really enjoyed Eyes of Justice. Each character has a unique personality. Wiehl did a great job of sharing their personal lives with us as they worked to solve the case. I really liked the new character Ophelia and hope to see more of her in future novels. I became emotionally invested in these women and wanted them to succeed. This is a faith-based novel, but Wiehl doesn’t drown us in religious messages. Instead, one of the characters is religious and draws on her faith to help her through the investigation. It felt genuine and not preachy. The plot had a great pace and twists that kept me glued to the book. I consumed this in a few sittings and was thoroughly entertained. I highly recommend this series to fans of mystery and crime thrillers. I have added the first three books in the Triple Threat Series to my wish list. Lis Wiehl is a talented writer and I look forward to reading more of her work. All of her novels are available in eBook, paper and audio formats. 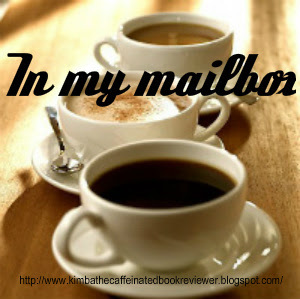 Do you like mystery thrillers? Spring into Horror Read-a-thon hosted by Michelle @ Castle Macabre. I will definitely do this again next year and hope to participate in more of the challenges! It's a chance to share News. showcase books and things we have received and share news about what is coming up for the week on our blog. The Coffee is fresh so grab a cup! This has been a crazy week all around, and I will be happy to put it behind me. This is a new weekly meme and I would be delighted if you participated. It's the perfect opportunity to recap what happened on your blog and highlight what's coming up. We are all busy and this offers us a chance to see what we might have missed. Plus it offers a place to showcase what we received during the week and give creds to those who made it possible! You can join in every week or as often as you like. The link will be open all week, that way you can post whatever day works for you. Coming up this week we have some exciting reviews: Eyes of Justice, Life in the Land of IS, Vanishing Game and Of Poseidon. I'll also be sharing an excerpt of Martuk..the Holy and interviewing Lada Ray author of Gold Train. There will also be a few giveaway so be sure to stop by! Have an awesome week! I know I will thanks to the release of three highly anticipated books on May 1st; Insurgent by Veronica Roth, Sweet Evil by Wendy Higgins, and The Last Boyfriend by Nora Roberts (BoonsBoro Trilogy #2). Who need sleep right? Have you ordered your copies? 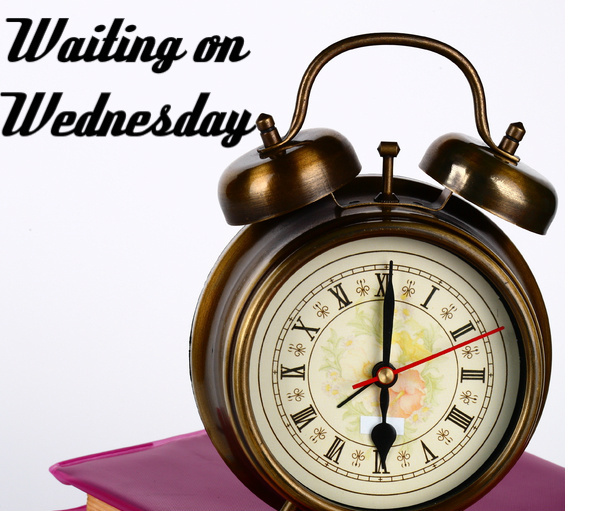 Is there a book being released this week that has you excited? Be sure and leave me a link to your news. Want to participate in the Sunday Post? Embraced by Blood is the second novel in Laurie London’s Sweetblood series. I first got into this series when Laurie asked me to review the third book in the series and I absolutely loved it. While reading it, I purchased books one and two for my Nook Tablet. Above you will see the links to both of those reviews. London’s books have some key elements that I love in paranormal romances; suspense, an awesome plot and swoon worthy heroes. All of her books can be read as standalone since each deal with a particular couple. To fully appreciate the fight against the Darkbloods, I recommend reading them in order. Embraced by Blood picks up sometime after book one ended. 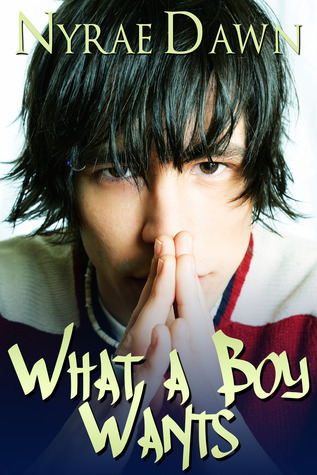 The novel focuses on Alfonso Serrano. He was agency tracker, Lily DeGraff’s, informant in the first novel, Bonded by Blood. He is slowly healing from his wounds and has separated himself from his family and Lily. While undercover in the Darkbloods organization he was forced to give a blood oath, and now they know he survived the blast that killed their leader. 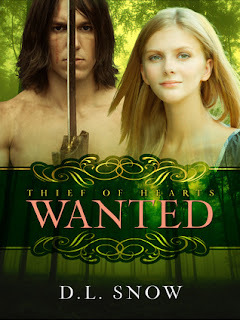 He is a hunted man, and will not put those he loves at risk. He is laying low and trying to replicate his childhood home on a cliff by the shore. Only when he is working with his hands can he forget all that he has lost. One night while out looking for a light snack, (a little o-positive) he runs across Darkbloods and learns about a computer game and a huge party offering Sweetblood. (This is a rare blood type that is highly addictive) Later, at the hardware store he runs into the agency’s Regional Commander, Tristan Santiago. Santiago wants him to come back to the agency. They are short handed with Alfonso’s brother Dom out of the country and the Darkbloods are causing problems. He refuses, but advises Santiago about what he has discovered. When Santiago informs him that Lily is back with her daughter, his fears go into overdrive. 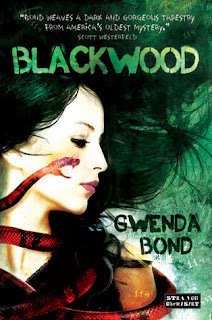 The Darkbloods are looking for trackers to find Sweetbloods and Lily is the best there is. He begins following her and her trainee partner. When he is satisfied that she is protected, he slinks back to his home, and thoughts of Lily fill his mind. What he doesn’t know is that Lily is having problems tracking and she fears that her days in the agency may be coming to an end. The tale that unfolds is action-packed and kept me captivated. I love the characters London has created. Alfonso is swoon-worthy, loyal and misunderstood. I found myself rooting for him from page one. Lily is sharp and independent. The thought of losing her skills makes her unsure of herself and her identity. Alfonso’s rejection cut her to the core, and yet she still wants him. Santiago has issues, but never doubts Alfonso. If only Alfonso’s brother could see; that all he has ever wanted is family. The romance is hot and at times quite steamy. London has a knack for creating sizzling love scenes that are mostly implied. The world-building is fascinating and focus on good vs evil. The Agency is sworn to protect humans and keep vampires hidden from them. The Darkbloods want to rule the world and view humans as nothing more than dinner. The cast of agency hunters and their partners intertwine in each of the novels, and I connected with them. I am excited about whose story will be told next. I highly recommend Embraced by Blood and all the books in the Sweetblood series to fans of paranormal romance and suspense. All of these books are available in eBook and paper. 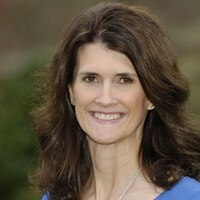 Laurie London is on my auto-order list. 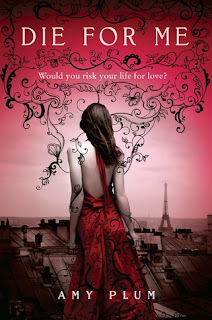 The Calling by Kelley Armstrong is the second in the Darkness Rising series. Armstrong picked up right where we left off and delivered non-stop action. Filled with shape-shifters, witches and other supernatural beings this book has ensured Armstrong a place on my favorite authors list. I plan to begin her other series as well. I strongly recommend you read The Gathering (my review), the first book in this series before attempting to read The Calling. Armstrong doesn’t waste any time with back-story and you will be completely lost without it. The tale begins inside the helicopter with Maya and her friends. Maya and the others are anxious to be reunited with their parents, when they realize the helicopter isn't traveling in the right direction and that the mayor is unconscious. When Daniel confronts the pilot, things quickly go from bad to worse, as the helicopter spins out of control and crashes. The tale that unfolds is action-packed as the kids attempt to escape and find their parents. While most of the plot advancement occurs in the last part of the book, we do see a lot of character growth and get a better understanding of the town and the kids. 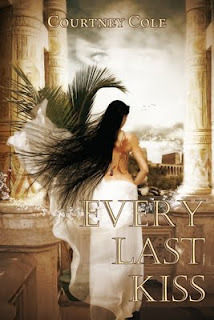 The ending sets us up for the final book in this trilogy and left me eager to read more. Maya and Daniel quickly establish themselves as leaders of the group. The kids begin to understand that they are different and that their little town of two hundred is anything but boring. Armstrong gives us conspiracies, secret agencies and a possible psycho-path among the teens. I found myself completely enthralled by the plot. Rafe and Maya’s romance develops further and felt genuine. Daniel begins to believe that he has abilities, and admits to having used them. He is like the mother-hen of the group and whether it’s because of his ability or not...the rest look to him for all the answers. Despite the circumstances they found themselves in, I was impressed with the way these kids kept it together. The growth in Maya was wonderful. In the first novel her moral compass was strictly black and white, and I found her at times to be very judgmental and unforgiving. In this novel we get a closer look at the other characters and Maya begins to understand them better. This isn’t to say that she still didn’t annoy me, but by the end of the novel she is able to rationalize better and think things through. In The Gathering, Maya experienced dreams of running in the wild, and felt like she communicated with animals. In The Calling, she shifts and it was neat to see how she handled this. Maya is fearless and protects those around her. She is confronted by a person from her past, and isn’t sure how to handle it. I really liked Corey. He is a funny, quirky and flawed character who made things interesting. I am really anxious to see everyone’s ability develop and see how they work as a team in the final installment. The plot Armstrong brings us in The Calling is extremely intense. The kids are involved in one life or death situation after another. Armstrong makes all of it believable and kept me engaged. 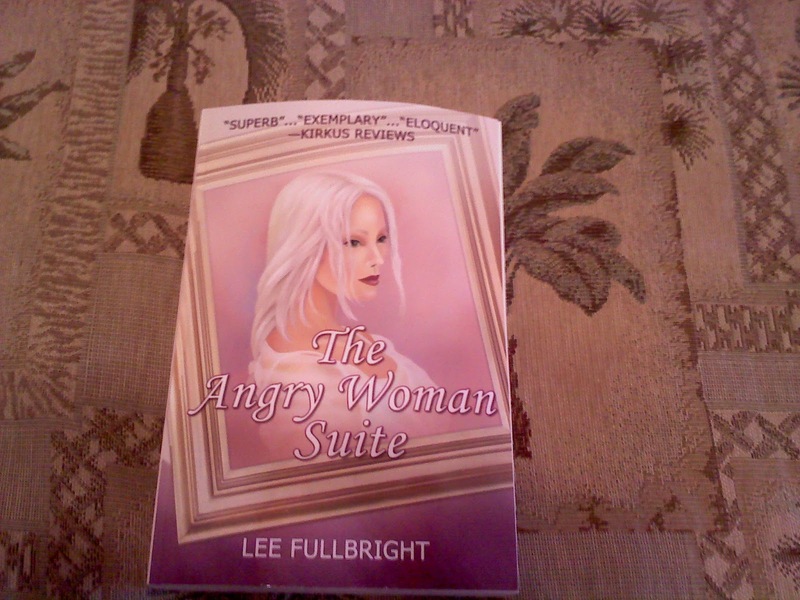 She has created a situation with multiple threats, and left even me the reader unsure about whom the good guys are. She created characters with depth, and I have come to care for them all. The action packed ending has me excited for book three and wondering how things will work out. I recommend this series to fans of paranormal suspense. The Darkness Rising series is sure to offer hours of entertainment. The Calling is currently available in paper, eBook and audio formats. Book three of the trilogy The Rising will be released sometime in 2013. The Kingdom on the Edge of Reality by author Gahan Hanmer. Welcome to Albert Keane's beautifully designed medieval kingdom nestled in a completely isolated river valley in the Canadian wilderness. Peaceful, happy, and prosperous, it takes nothing from the modern world, not so much as a single clock. There is a castle, of course, and a monastery. There is even a pitch dark, rat-infested dungeon - because you simply have to have one if you are trying to rule a feudal kingdom! So why has Jack Darcey - actor, wanderer, ex-competitive fencer - been tricked and seduced into paying a visit? And why hasn't anyone told him that the only way to leave is a perilous trek across hundreds of miles of trackless wilderness without a compass or a map? 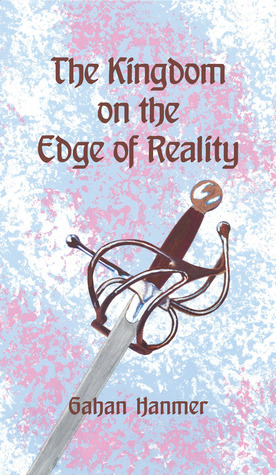 The Kingdom on the Edge of Reality by Gahan Hanmer offers a modern day medieval tale with a message of survival and hope. Hanmer takes us on an imaginative journey filled with romance, violence, and deception. I found the tale to be enchanting as it delivered a message about technology and its impact on human relationships. Protagonist Jack Darcey is the hero in this novel. When we meet Jack, he is at a crossroads in his life. He is down on his luck and unsure which road to travel next. His old friend from prep school, Albert, sends an employee to deliver Jack to his home. Albert spins a tale about the kingdom he has created in the woods of Canada. He urges Jack to join him. Jack finds the kingdom is isolated from the outside world as a helicopter delivers him. Here he finds a kingdom complete with a grand castle. There is no electricity, a dungeon and a monastery. He finds farmers and skilled workers to perform all sorts of tasks. The monks teach school and run a hospital of sorts. Just as Sir Jack, now a knight begins to enjoy this medieval life, conflict brews and a battle breaks out. A prediction is made that Sir Jack can save the kingdom and the tale that unfolds is fascinating and at times dark. I didn't love Jack, but he ultimately tries to do right. Jack really takes to this medieval life and as a knight he truly looks out for all the people of the kingdom. His journey of self-discovery while painful was enlightening. At times I wanted to shake him and his actions annoyed me. Duke Hawke someone from Jack’s past wants to rule the kingdom. I cannot help but wonder if Albert didn't deliberately set up this chess game. I would have liked to have seen some of the characters more fleshed out, and some of the conversations seemed awkward. The tale was filled with good and evil characters. Sadly even in this utopia; greed, jealousy and politics still exists. Hanmer world-building was delightful and the tale he spun interesting. He weaves a tale, all while posing the questions, "Are we losing our humanity as we become more connected?” His depiction of time spent in a dungeon felt genuine and was eerie. I find this time period romantic, but would miss modern inventions. While I felt parts of this tale were flawed, I enjoyed the overall story. Kingdom on the Edge of Reality was an easy read, and I breezed through it in a single afternoon. 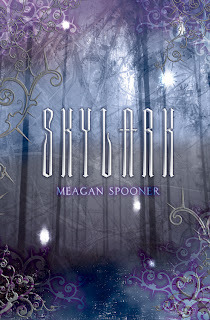 I recommend it to fans of historical fiction and fantasy. Kingdom on the Edge of Reality is available both in paper and eBook format. I gave this novel 3 coffee cups out of 5. About the author: Gahan Hanmer enjoyed a colorful career in the theater as actor, director, designer and technician, and also wandered extensively searching for love, happiness and truth. He unintentionally became a grown-up raising two beloved daughters and now lives in the high chaparral desert of California. OK, my coffee lovin' and book readin' peeps..If you haven't heard of this series you need to remedy that! The Charley Davidson series is one of the funniest urban fantasy series around. Filled with mystery, a grim-reaper and the son of Satan..it offers something everyone will enjoy. The protagonist Charley is fantastic and so is her quirky side-kick Cookie. I am anxiously awaiting this fourth novel! Here are my reviews of the last two novels; Second Grave on the Left and Third Grave Dead Ahead. The First novel is First Grave on the Right. I cannot wait to get my hands on this one! 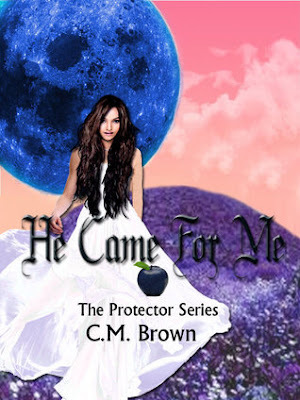 Today Carolyn Brown is sharing an excerpt of her paranormal romance He Came for Me. In addition she had graciously agreed to give away and eBook copy of her novel. Enjoy and good luck! Jazz, lives on the beautiful Sunshine Coast, in Queensland, Australia. She leads a normal teenage life busy with friends, TAFE College, a part time job as a waitress, surfing and searching for a boyfriend! Until one day driving on her way to TAFE she is passed by a red Mazda Rx7. The driver holds her attention and as they both wait at a set of traffic lights to change to green, a sexual tension passes between them. In the days that follow she finds that this guy moves into her life as she befriends him, his friends and family! But are Seb and his friends what they seem to be? Attacks by groups of boys targeting girls Jazz's age are becoming noticed by the media. Eyewitnesses to the attacks state that these youths seem to possess abilities no normal human would be capable of. Is it drugs or is it something else? Jazz finds that Seb, seems to be stalking her. What is his purpose? Is he really a friend or is he actually a foe? “What do you think you are doing?” I demanded. “I was just checking on you, Seb.” she replied. “Surely, you knew that Vern and I were patrolling tonight?” I asked. “Well, yeah, but I just wanted to make sure that you were okay.” “I knew that you haven’t quite decided in which direction you will go with regards to Jazz, but I just couldn’t help myself I had to follow you over here to tell you that I believe in you, Seb.” “I know that you will be able to make the right decision and whatever you decide I want you to know that I will support you one hundred percent!” At that moment we all heard a familiar noise coming from Jazz’s upstairs bedroom. I immediately ran and jumped up onto the tree branch level with Jazz’s window to glimpse what was happening in her room. To my amazement a porthole was opening up on the far side of her bedroom. I sat transfixed watching it open wide to allow the form inside to take shape and move towards Jazz as she slept in her bed. My heart told me to jump through the window and save Jazz from this new threat but my mind stopped me with the knowledge that I would be unable to enter the room as I had never been invited into the house by any of its occupants. I watched anxiously as this visitor stood gazing down at Jazz’s sleeping form. It was hard to place who this intruder was, but it was easy to see that he came from my world. His silver, blond hair hung loosely down his back and he looked older than most of our kind. It seemed as though he was familiar with his surroundings, which meant he had been in Jazz’s room before! I watched helplessly through the window, unable to enter the room to intervene, anxiously watching the scene before my eyes, as if it was taking place in a movie. Jazz lay asleep, unaware of the visiting presence in her room, innocently sleeping as the man made his way in the darkness towards her. He stood at the foot of her bed and silently watched as she slept. Not understanding what was going on, I sat on the tree branch watching, trying not to make any sudden noises or movement so as not to attract the attention of the intruder. He started to chant in a prayer form using a language forgotten by my people. I could only decipher some of the words as I had studied it a very long time ago because of my interest in our old dialects. He seemed to be blessing Jazz and asking for forgiveness because he had left her alone for so long. Below me Bliss and Vern were anxiously trying to get my attention, but I did not want to take my eyes off of this stranger, in case he tried to harm Jazz. Although I knew I would be unable to intervene in any way, I still felt that it was my responsibility to protect her. I could see his lips move as he spoke quietly, chanting the prayer. Jazz started to toss fitfully in her sleep as this stranger continued. My heart struggled with the desire to stop what was happening before my eyes but I knew I was unable to do so. I froze when he bent down and kissed her on the forehead and gently pushed back a lock of loose hair which had fallen across her cheek. He moved away from the bed and stepped back into the porthole, just before it closed. Once he stepped into the porthole he turned and looked straight at me. I was sure that he tilted his head slightly in my direction as if he was acknowledging me but I couldn’t be sure as the porthole closed and he was gone! Jazz was still sleeping soundly unaware of the intrusion, so I jumped down to Vern and Bliss who were anxious to find out what had just occurred. 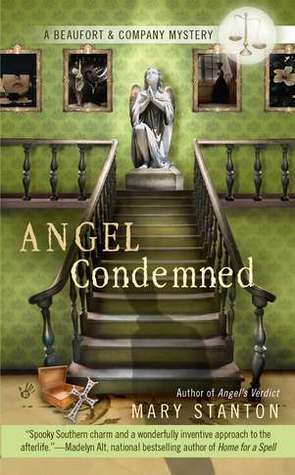 I knew that they would be as shocked as I.
Angel Condemned by Mary Stanton is the fifth in a cozy paranormal mystery series called Beaufort and Company. In this installment we have an ancient artifact that may be a key to one of the gates of hell, a murder and a case that can be linked back to Brianna’s mother Leah. This suspenseful novel was delightful and I loved re-visiting all the unique and colorful characters. Brianna Winston-Beaufort has recently opened two law firms in Savannah, Georgia. She inherited the practices from her Uncle Frank. The first office is located in a beautiful old office building on Bay Street. She has hired a spunky secretary who works part-time while obtaining her GED. She plans to go to college to become a Para-legal. Here Brianna deals with temporal cases or cases involving living clients. Brianna’s second office is located in a house on Angelus Street. This office is surrounded by a cemetery. Here Brianna’s staff consists of angels. This is her celestial office and she deals with souls who believe they have been wrongly condemned to hell. A lot of times the two cases are connected. Since opening her doors, Brianna and her staff have solved four murders for her temporal office and reduced or eliminated the sentences for four souls. All of this occurs because she and her staff are forced to act as detectives to solve the celestial cases. Because of the nature of her work, she has been provided a lot of heavenly help. She has a loving dog named Sasha who can communicate and warn her. 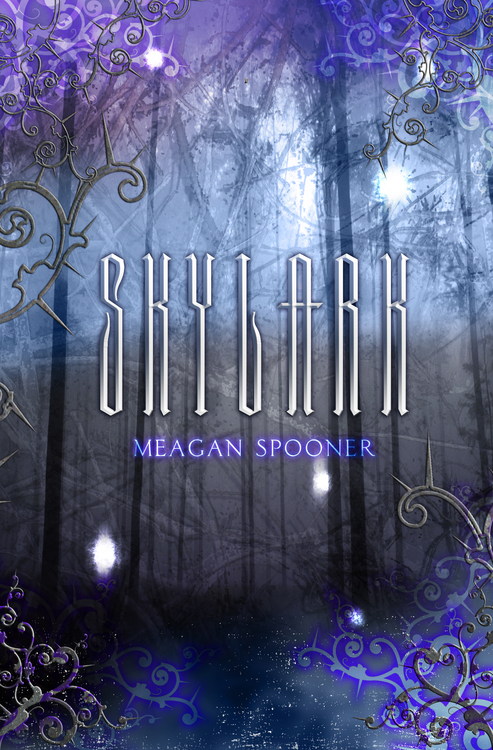 Vicious guard dogs, her staff and an Arch Angel who appears when she is in grave danger. In this novel, Brianna’s Aunt Cissy wants her to represent her fiance in a lawsuit regarding a magazine. This case is anything but simple, when the fiance is murdered with Aunt Cissy’s kitchen knife. Then an old artifact surfaces with a soul condemned to spend eternity in hell. Brianna has been burning the wick at both ends, and these two cases may be more then she can handle. The tale that unfolds is interesting with twists and turns. The characters in Stanton’s novel are delightfully southern and each unique. I always enjoy their interactions. Brianna’s family would give me a headache with their meddling ways, but they love Brianna. Stanton does a wonderful job of describing Savannah and the buildings there. The celestial court, Brianna's role and the cases are all fascinating and Stanton's attention to detail is appreciated. I recommend Angel Condemned and the Beaufort and Company series to fans of cozy mysteries with a paranormal twist. While they could be read as a standalone, I do not recommend it. There are a lot of characters and each novel reveals more about the celestial court, how Brianna was chosen for this duty and why. Stanton also has a young adult fantasy series called Unicorns of Balinor. 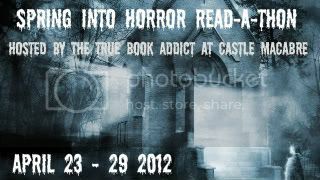 This week I am joining a week-long read-a-thon hosted by Michelle @ Castle Macabre. You do not have to be a blogger to join in the fun. The goal is to read as many books as you can and have at least one of those be a scary book! This can be horror, paranormal, supernatural, suspense or mystery. I hope you will join in the fun. Just click on the image to sign-up. I am not sure how many I will complete. My goal is the read at least the first three. Hope you decide to join in!